Following on from my inspiration to pair rhubarb with fennel, I have been doing a few more experiments with rhubarb. I have lifted today’s idea almost wholesale from the Mister Kitchen rhubarb tasting menu. 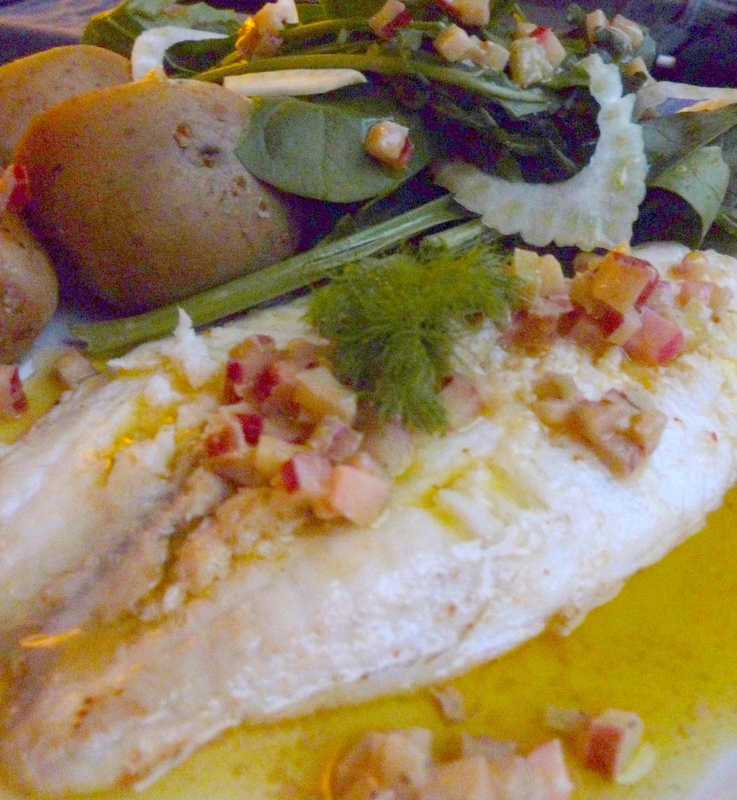 They served a sea bass with spinach and a rhubarb vinaigrette. It was great. Of course, I had to come home and fiddle about with it. Rhubarb is most frequently eaten as dessert, and I am certainly partial to desserts and cakes with it in. People forget that it is actually a vegetable. It is seldom seen in savoury dishes, although I do know that a few bloggers have been experimenting with salads and as savoury compotes lately, so maybe there is a resurgence of rhubarb as a side dish in the offing. Who knows? I certainly have a few more ideas that I want to try before my plant goes over this year, or I rest it in preparation for winter. Of course, once I am happy with each of the dishes, I will be sharing them here with you. The version that I ate at Mr Kitchen had a mild olive oil, finely diced rhubarb and kalamata olives, with the stones pushed out, and the flesh torn into chunks. It was rustic and very simple. And it was delicious with the fish and the greens. Raw rhubarb is crunchy and subtle. If you decide to follow my lead and make up a vinaigrette yourself, make sure whatever you use does not over power it. I stuck with very simple flavours for this vinaigrette – in fact it is a classic French dressing, with the addition of rhubarb. It works quite well with a pinch of chilli flakes, and with tarragon or chervil, instead of the mustard. I personally think that it is better with the more grassy olive oils, not the really punchy ones, but you may disagree. Since there is nothing simpler than a vinaigrette, and rhubarb is at the peak of the season, I thought that I’d be a bot cheeky and have two entries to this month’s Simple and in Season, hosted by Ren Behan. I do recommend that you give a rhubarb dressing a go. This one was lovely with salad and great with fish (I served it with tilapia fillet). I bet it would also be perfect with pork or chicken too. What classic dressings do you know that might benefit from a little rhubarb? Once the rhubarb is prepared, Whisk together the mustard, zest and olive oil. I used lemon with this dressing, because I wanted it to go with fish. You could also team the dressing with orange. Grapefruit works as well, although you will need much less than half the grapefruit zest. Which one you choose is entirely up to you, and you can change it to match your dish. Add the rhubarb, and season. You will need to taste it at this stage. I found that adding a little lemon juice really lifted this into a great dressing, but the amount that you will need will depend on which citrus you are using, and how sharp your rhubarb is; which will vary with age, size and how long ago it was harvested. Serve immediately if you can, on fish, a salad, or anything you like really. It does keep for a couple of days in the fridge, but it is better fresh, because the rhubarb will lose its crunch. So simple, there’s no excuse not to give this a go! The week started (or last week ended, depending on your viewpoint) with the Seedy Penpals, Cityplot and Mediamatic Zaadruilen (Seed exchange) on Sunday. The day started out bright and crisp, a great day for a seed swap. We headed over to the Mediamatic Fabriek with bags full of seeds, and the hope that there would be enough variety to share. Unfortunately for us, the heavens opened just before 2.00, when the swap was due to start. Although I was inside, and couldn’t see out, I knew from the sound that it was raining cats, dogs, and probably a few farm animals as well. I am sure that this put many people off, as the mediamatic events are usually very well attended. Nevertheless, quite a few intrepid people did make it, and brought a lot of seed to boot. It was great to make connections wit more people who want to grow and share seed, and to find out about all the initiatives that there are in town, or that people want to get off the ground. ASEED were also there. They brought seeds, and they also gave a workshop on seed saving, and the importance of maintaining plant varieties that are being lost as we see more and more of our plants (particularly food) being grown from fewer varieties that are bred to look good or last well on our supermarket shelves, or be resistant to pesticides etc. This issue is becoming increasingly more important as we see more and more laws passed globally that try to restrict the distribution of seeds, and concentrate it in the hands of a few companies, instead of using traditional methods of saving a portion of the harvest to grow the following year. This weekend in Vienna, a group of NGOs are getting together to discuss proposed legislation in the EU that would become even more restrictive on the sharing and saving of seeds, and the issue of owning “intellectual property” of seed varieties and genetic strains. I think that it is important to push back about this, for many reasons, and look forward to being able to do a small part in the push to amend this legislation, and make it possible to continue to grow, save and share my own seed. People came with their own seeds, some that they had bought, but many that they had saved themselves. I took a lot of seeds, but my favourite was the runner beans that I have grown from seeds that my Dad gave me. I love to share that story, and many people were interested, and took some for themselves. I also learned a few of the stories that other people told along with their seeds too. As we were doing the event along with Mediamatic, we also included an artistic element. We made a beautiful rangoli from pulses. A rangoli are colourful Indian artworks usually made from seeds, coloured flour, rice or sand traditionally made by Hindu women to use as decorations at festivals. I also learned that the form has been used to plot out a farm and the rotation system, so that you had a visual representation of what should be planted where, that is easy to follow, even if you may not read. I think that is a lovely idea. Since they were edibles, we thought that we would share them with the people who came to swap seeds, so we made a Souper Seed Mix. 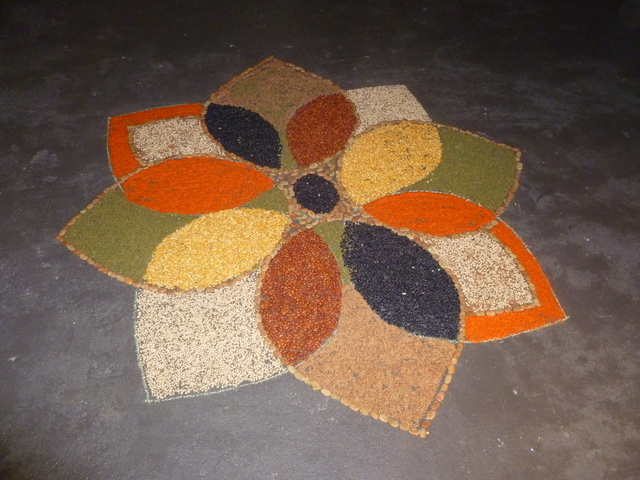 We gave packages with beans or lentils, that we used in the rangoli, plus a spice mix. Obviously, there was no way that I was going to waste all that good seed. I figured that people could then choose to plant them, or eat them. I tested this recipie first, using home grown Harlequin potatoes, but you could use any firm-fleshed potato. It turned out that the potato was the only seed of all of the ingredients that I used that did not appear at the swap, but I expect that this was more due to the time of year. 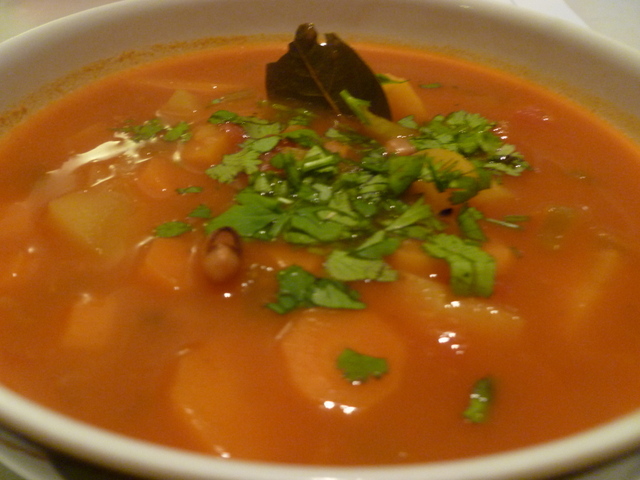 So, here is my Rangoli Soup. A few people from the swap have already tried this, and the reports have been good so far. It seems it id good, with or without the art! Soak the beans in cold water overnight. If you have lentils or split peas, you skip the soaking stage. In fresh, cold water, bring the beans up to the boil and then simmer until tender. This may take between 40 minutes and an hour, depending on the type of bean. Once they are cooked, drain the water off, and set aside. In a dry pan, toast the spice seed mix, until they brown, and the mustard seeds start to pop. Grind them to a powder. Make a paste with the seed powder, turmeric, chilli powder, garlic, ginger and tomato purée. Gently fry the onion,celery and bay leaves in the oil, until they are translucent. Add the paste and cook for 2 minutes, stirring well so that the spices don’t burn. Add the carrot, potato, pumpkin, the cooked beans, stock and tomatoes, and cook until the vegetables are tender – about 10 minutes. Serve with some chopped coriander or parsley sprinkled over the top. I am very happy to announce that Seedy Penpals is going to be live at the Mediamatic Ruilen (exchange) exhibition. This Sunday, 4th November, I shall be there in partnership with the wonderful Cityplot crew, with a load of edible and beautiful seeds that you can grow to eat, admire, save and share. Doors open at 2.00 pm, and you can come and swap seeds of any kind, share growing tips, and tell us your growing stories, seed folklore or something lovely about your plot, whether it is a balcony, moestuin, or a field! Sharing seeds allows us to preserve more varieties, especially heritage types. Recent developments in the Dutch and international seed business have led to a concentrated market and, with it, a diminished variety of available seeds. We can help create wildlife habitats at home, allowing us to benefit from the beauty of flora and fauna sharing our spaces, and allowing these plants and animals to continue to thrive. Fresh food and flowers will last longer for you. You are also encouraged to share growing tips about the seeds – do they like shade, or full sun; do they like a lot of water, or will the Amsterdam sky provide you with all they need; when to plant them? We also have the facility to share stories about your growing space, folklore about your seeds, photos of your plants (if you can bring them digitally, or e-mail them to me), so you can bring them along, or write them down on the day if you like. We will also accept stories and photos in exchange for seed, if you don’t have any spare seed. 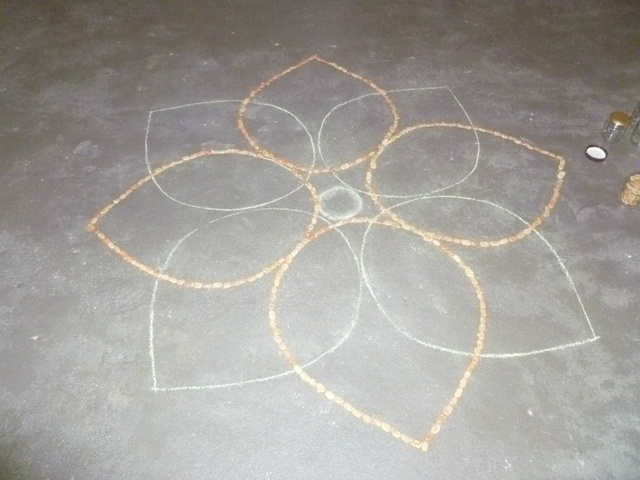 We will be creating a beautiful Rangoli with a few of each ruilers’ seeds throughout the day. 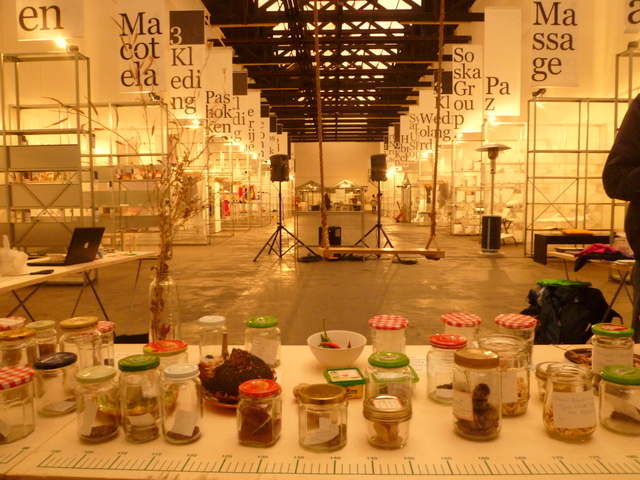 The seed swap will take place on November 4, from 14.00 to 17.00 in Mediamatic Fabriek, VOC-kade 10. You can trade free entrance for a chore like an hour of barkeeping or half an hour of vacuum cleaning. Otherwise it’s € 5,- for a membership including free entrance for a month. Children half price. The Mediamatic Fabriek is behind the Parool building in Amsterdam Oostelijke Eilanden. The seed swap is part of Ruilen, an exhibition, events and online marketplace from October 20 till January 6. Open from Wednesday through Sunday, from 13.00 to 18.00. Well, another month has flown by, and it is the time that we should be giving you the opportunity to link up any blog updates that you may have. If you have a post that you would like to add to the mix, then please do feel free to use the linky below. 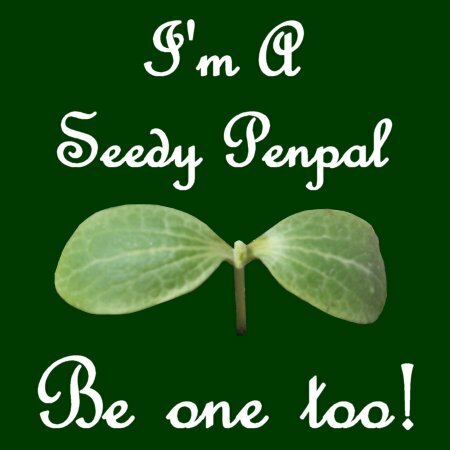 I have been watching the hashtag #SeedyPenpals on Twitter, and have enjoyed reading some of the tweets that you have sent to and fro about your plants and seeds etc. I thought that I would do a little bit of a round up of some of the things that I have seen around (seeing as this is a not-at-all-hastily-put-together post. Honest). 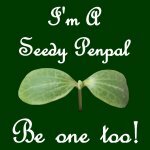 I will also do a bit of blog hop of my own to see what else I can pick up, and I’ll add any #SeedyPenpals tweets here while I look for a better way to capture them. For me, the most joy from Seedy Penpals has not been the setting up of the scheme, or the swap, discovering new seeds, or even planting them. Although these things have all been a lot of fun, and have brought me a lot of joy. Still, the thing that I have enjoyed most is all of the little things that neither Carl nor I foresaw when we set up the scheme. On Twitter I saw that a couple of people who just missed out on the first round had organised themselves into their own private swap. I love this, I am glad that neither of them had to miss out on the fun, and I hope that they will both join all of us in the early spring. I’m also pleased that people think it’s a good enough idea to do their own. 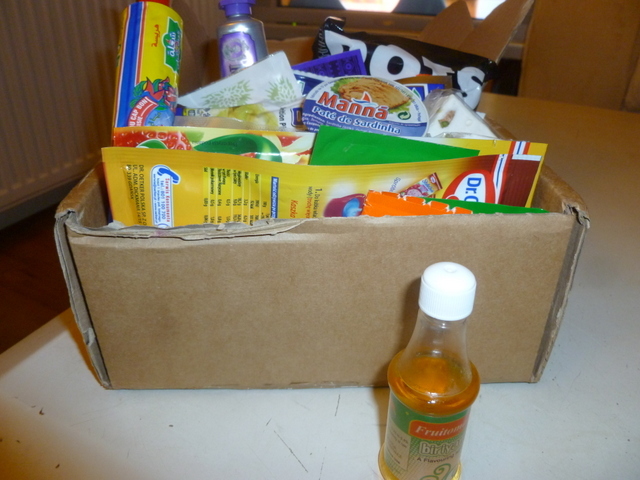 I have seen Carl share loads of things with other Seedy Penpals, including keffir as well as other boxes of goodies, and the usual help and advice. Of course, I am sure that he would have done this anyway; he is a very generous man who is always willing to help out. But I probably wouldn’t have seen them share, or know that people have been busy sending him things too. And this is the thing, I have seen some old friends sharing, and I have watched new friendships blossom. And this is where the most joy has come for me. Watching these interactions, and seeing the friendships grow, even if the seeds haven’t all been planted. You are a pretty generous lot in the main, and I love to see it. This is not to say that the seeds have not been growing. Mine have sprung to life, I’m just hoping that the frost doesn’t get them before I get home. Michelle at Veg Plotting has also updated me to say that the fennel that she was sent have done well. Although she planted them a little late to produce big fat bulbs, she has been enjoying the herby fronds in her salads. She has them under cover for the winter now, so I hope there is still quite a bit of mileage in them yet. Have you seen any progress? Let us know in the comments. Lorraine even had time to plant beans, and is cropping them now, as well as fitting in a little baking. Outdoor work done,#SeedyPenpals beans picked for tea, now time to make my first ever bread from scratch. Have been inspired by#GBBO . I’ll add more if you have tweeted them. I have to admit that I am not at home at the moment, and that I don’t have the promised photos of the amaranths that I planted from my first Seedy Packet. 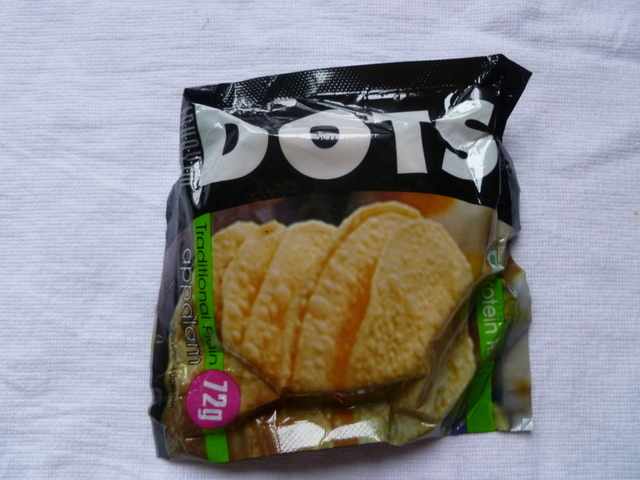 But, my penpal Charlotte and I have also kept in touch, and this month we sent each other a food packet too. Mine was garden inspired, and I sent her foodstuff that I had grown, made or foraged, as well as a few Dutch goodies, and some hibiscus tea (which I didn’t grow). All I can say about my parcel is wow; if Charlotte managed to pack this much into such a small box, then I’d love to see her skills at Tetris! 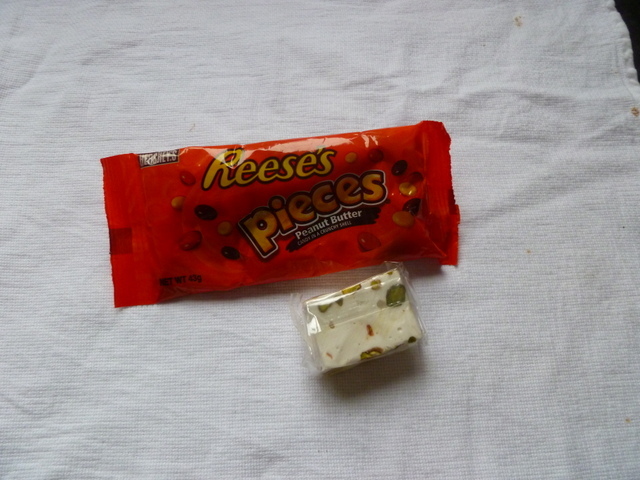 I got loads of her favourite things, like the semolina/ jelly style desserts, the butter chicken, the sardine paste and the Reese’s pieces. 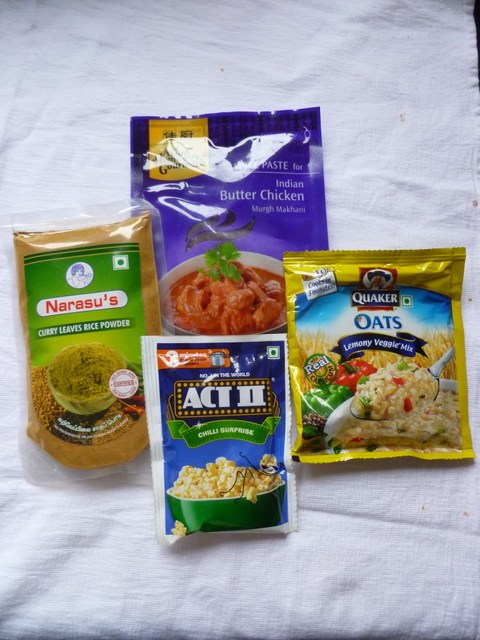 She also sent me some things from her travels – the curry leaf powder, popadoms, the savoury oatmeal (yes, savoury, I am fascinated), chilli popcorn (unpopped) and a small bottle of biryani. It is fragrant with cloves, and has really got me thinking what I can use it with. It scented the box beautifully. As well as the sardine pate, I got some interesting seasoning. 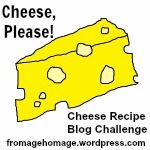 Charlotte says it makes any savoury dish amazing, so I am looking forward to experimenting. 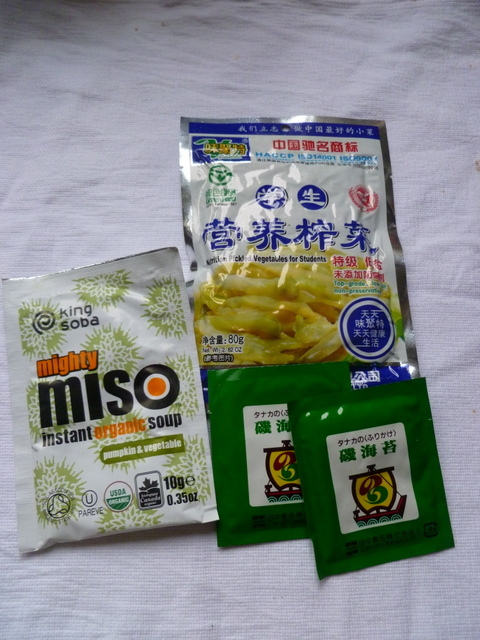 There were some East Asian delights too. A really interesting pumpkin miso, tea and pickled vegetables. I love me a good pickle, so these will be the inspiration for a good meal later in the week. I got a tube of a nice fiery Harrissa. 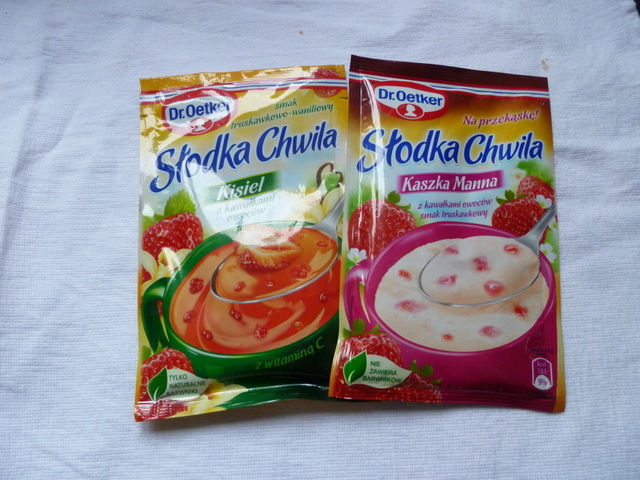 I love this stuff, and will be adding it to soups, stews and many random things in the near future. There was also some more nougat and exquisite Turkish delight. Unfortunately I scoffed most of it forgot to take photos of that, but it has inspired me to have a go at my own. I often have egg whites knocking about, due to my custard habit, and I can feel experiments in foraged fruits coming on too. 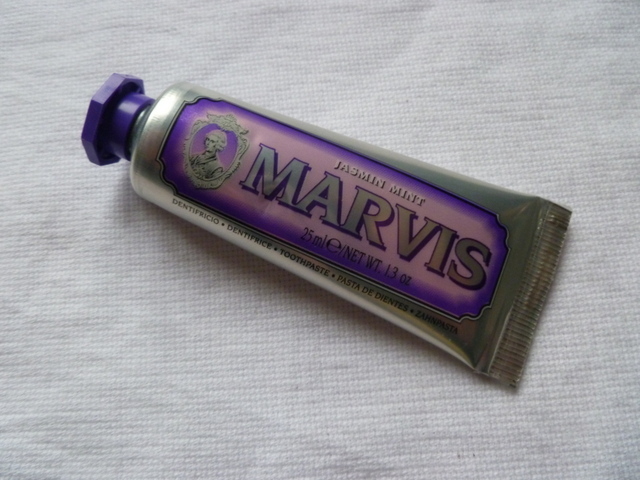 To make sure all the treats didn’t send me to the dentist, she also included this gorgeous toothpaste. Mint and Jasmine. Brilliant, definitely a change. Thank you Charlotte, I have been so inspired by your box, and I have never tried ay of the items in it, so I’m looking forward to trying them all out. And thanks also to all you Seedy Penpals, for bringing me such joy – especially in ways that I wasn’t expecting. Every year I grow runner beans in my garden. I don’t know what variety they are, they were originally given to me by my father from seed that he saved from his garden. I have never bought runner beans, and subsequent generations of dad’s seeds have grown successfully across four different gardens/climates and in two different countries. We always had runner beans, fresh from the garden, throughout the summer and early autumn months. I used to take them for granted, since they always came, no matter what the weather or growing conditions that year. After I moved out of home, I only really got runner beans if I was visiting my parents. Back then, I tended to shop in supermarkets, and runner beans were not a popular supermarket choice, maybe because it is hard to get them to be completely uniform, like the Stepford style apples and tomatoes that they prefer to sell. When I first started to get a veg box, I got some runners, to my delight. Just like Mum used to, I settled in to string and slice them. I was jolted by a powerful memory of Mum doing this, often in front of Last of the Summer Wine on a Sunday evening. When large amounts of beans were being prepared, I always got a bit excited, because I knew that the next day she would make Green Bean Chutney. Just as my Dad always grew our vegetables, Mum always made a lot of our food from scratch. Chutneys, pickles and jams were no exception. In fact, I didn’t have factory produced jam until I left home; and frankly, I found it wanting. I have always loved Green Bean Chutney. 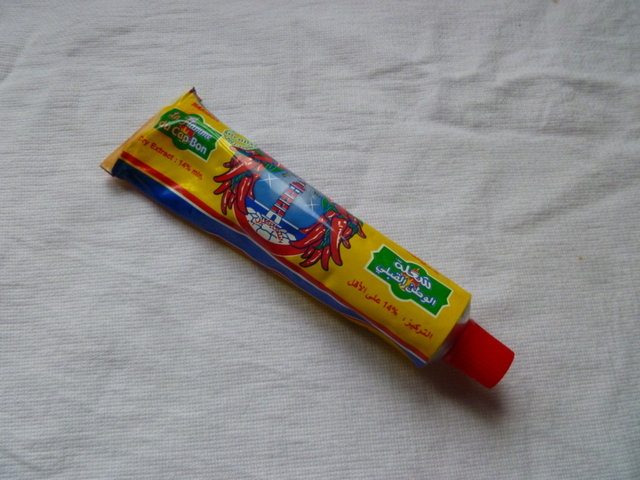 I used to have it every day at school, and all of the other kids would say stuff like “eurgh, that’s gross” and “Why do you always have that yellow stuff in your sandwiches?”. I would smile at them, safe in the knowledge that they didn’t know what they were missing, and if they didn’t want to try any, then Mum would be less tempted to give some away. Now I am older, I make Green Bean Chutney for myself. The Big Guy is a total convert as well. As you may have seen, I am a bit of a preserving addict, so I am always giving them as gifts to friends and relatives. Despite the fact that we grow extra runner beans, so that we can make this chutney, the Big Guy still severely rations the Green Bean, in order to keep more for himself. If I am honest, I am a little loathe to give it away, too! So, I thought that I would share the recipe for Green Bean Chutney with you, in the hope that you can make it for yourselves, and I get to keep all of the jars that I make! 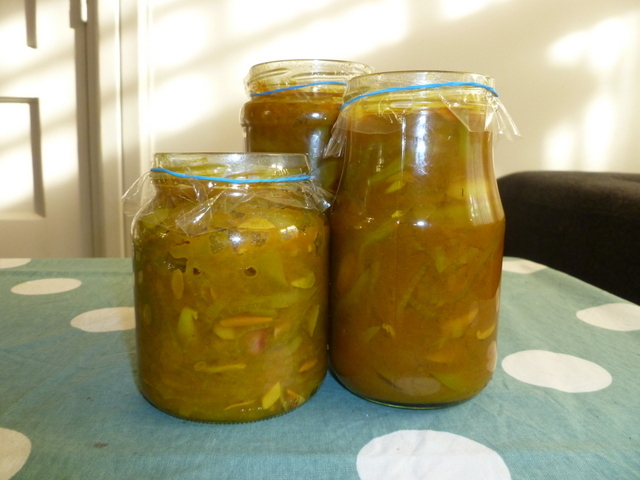 So, here is my Mum’s Green Bean Chutney. She gave it to me, but I am not really sure where she got it from originally. Maybe she can let you know, by leaving her first ever blog comment – over to you Mum? 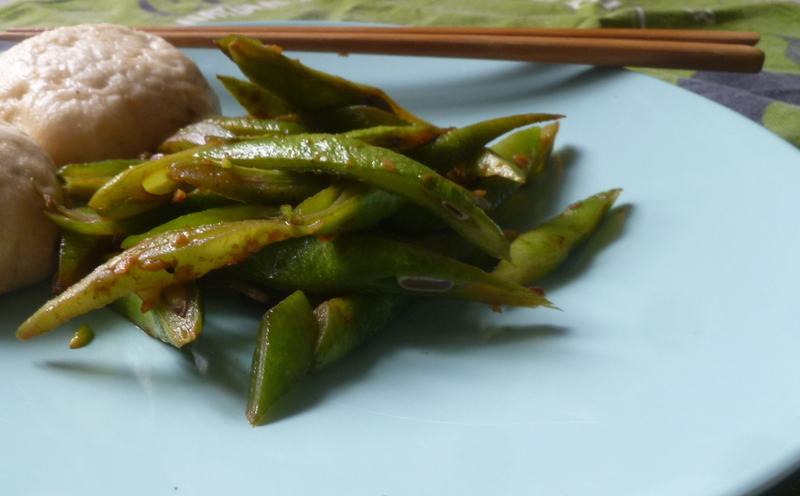 You can also use French Beans in this recipe, or a mixture of both French and Runners. Next year, thanks to my Seedy Penpal, Charlotte, I am going to grow a few yard long beans too, so I shall be experimenting with those as well. My bean harvest was a little late getting going this year, but hopefully you will still be able to find some beans to try it yourself. 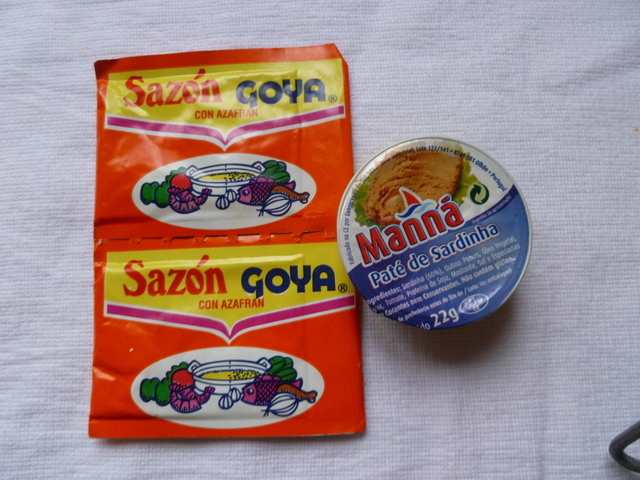 Do you have any food that evokes such strong childhood memories? I’d love to hear about them. Sterilise the jam jars in a dishwasher, or wash them in hot water, dry them and leave them in a low oven while you make the chutney. Either way, they will need to be hot when you put the chutney in it. 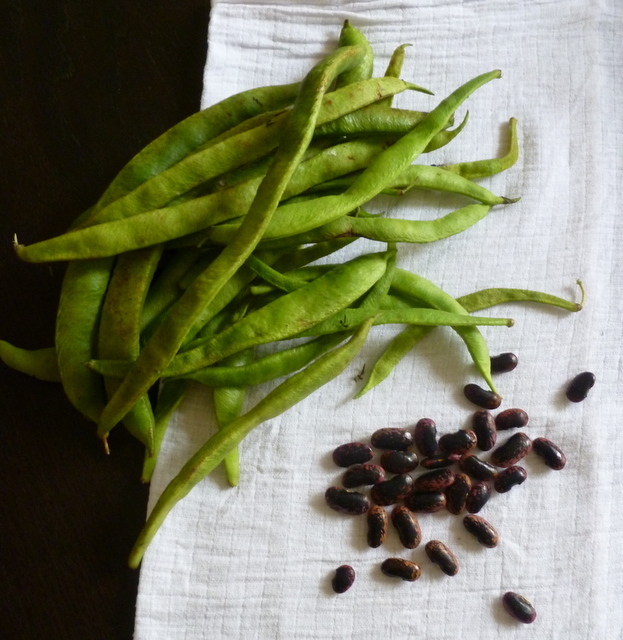 String and slice the beans (or use a stringless variety), making sure that they are roughly the same size – this is especially important if you use a mix of bean varieties. Peel and thinly slice the onions. Add them to a preserving pan (or a heavy-bottomed stainless steel pan) with the beans, cover them in water, and add the salt. Cook for about 10 minutes, or until tender. Strain the water, and return the vegetables to the pan. Add half of the vinegar and the sugar. Cook for a further 10 minutes. Mix together the cornflour, spices and the rest of the vinegar, and mix to make sure there are no lumps. Pour this into the pan, with the vegetables. Bring the chutney back up to the boil, and hold it there for a few minutes, until the mixture thickens. You need some liquid though, because this will stop it drying out in the jars. Fill the hot jars with the chutney. Then distribute the liquid between the jars, so that they are full to about 3 mm from the top. Put a wax disc, wax side down, over the chutney, and seal it with cellophane. Don’t use a lid, the vinegar will corrode the metal, and may leave you exposed to some nasty microbial activity. Don’t discard any excess liquid, it is great in salad dressings. You need to leave the chutney for a week to allow it to meld and mellow. This is a brilliant accompaniment to cheese, cold meats, salads, and is a particular marvel with jacket potatoes, and bubble and squeak. UPDATE: In a very timely way, I found out that Susan at A Little Bit of Heaven on A Plate is running a Home Made and Well Preserved competition. 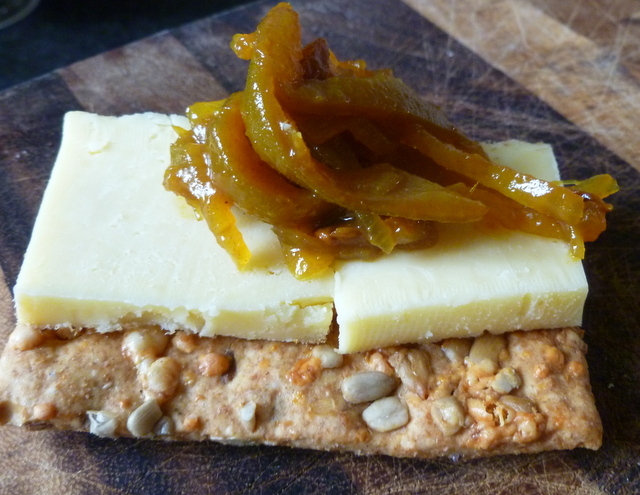 So I thought that I would share my lovely childhood chutney there too, and maybe win some spices (fingers crossed).